Farmstays are well- suited to meet the needs of travelers looking for unique and genuine experiences. They offer people a way to reconnect with their agrarian roots—or to form new roots. While research has not been conducted in Minnesota on travelers’ interest in farmstays, the success of existing farmstays, as well as natural food co-ops, farmers’ markets, and “buy-local” campaigns indicate that the opportunity is there. Many people are hungry to establish a relationship with the land on which their food is grown and with the farmers who grow it. This manual is not meant to be comprehensive, but rather a first stop for those considering a farmstay in Minnesota. Since we won’t cover everything you’ll need to know in this guide, we will refer you to other publications, organizations, and agencies that can aid in the various aspects of developing a farmstay. 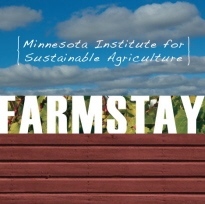 This Farmstay Manual was a collaboration of the Minnesota Institute for Sustainable Agriculture, Renewing the Countryside, and the University of Minnesota Tourism Center. "This publication was a collaborative effort of the Minnesota Institute for Sustainable Agriculture, Three Rivers RC&D (Productive Conservation on Working Landscapes Grant), Renewing the Countryside, the McKnight Foundation, and North Central Risk Management Education Center. "